My mother bought a sweet little Christmas cookbook in the hospital gift shop where my father had surgery a few weeks ago (Simply Christmas Cookbook, 2009). So many of the recipes sound delicious, yet extremely easy and simple. So my mother, with the help of Ashleigh (my niece) chose to prepare a few cheese logs for all of us to nibble on. I haven’t seen cheese balls or logs as appetizers or snack options in several years, so it was nice to have them again. These are truly very good and much better than your average everyday cheese ball or log, so if you’re watching your calories, then just have a slice or two, and no more! Sounds difficult, but if I can do it, so can anyone. Plus these make great gifts! 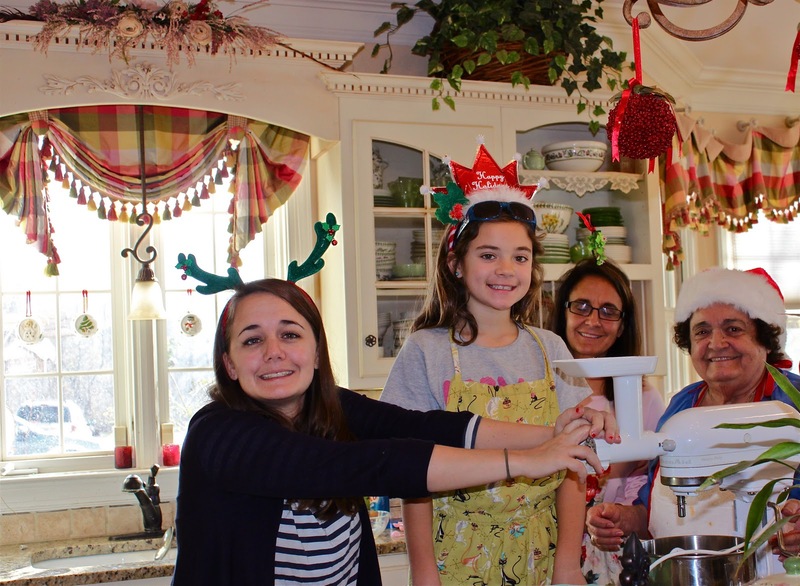 In the kitchen cooking up some love: my daughter, Lauren, Ashleigh (standing on a step stool), my sister, Kelly, and my mother, Retha. Each of them is spreading more holiday cheer with their Christmas hats! Kelly has a mistletoe hanging over her forehead on her little hat! 1 (5 oz) can of chunk white chicken, drained OR use the same amount of leftover chicken from making chicken broth (shredded). We make chicken broth (brodo) every holiday for the Tortellini in Brodo and have a lot of left over cooked chicken. In a medium bowl, combine the cream cheese, ranch dressing mix, and chicken. Form the mixture into a log. On a piece of wax paper, spread out the chopped pecans. Roll the log in the pecans until it is completely coated. If you enjoyed this recipe, please pin it on Pinterest and/or share it on Instagram! Thank you so much! I love love love these log recipes! It has been many years since we placed a cheese log on the table. I think I will make these for New Years!!! Thanks!!! My hubby will love these. Now I’m hungry! Oh, Roz, loved the photo! Your family exudes happiness. I even loved the valences in previous posts and the ones that are in your kitchen are also beautiful. Where do you find such lovely valences? My kitchen windows have been bare for a long time because I never see any I like. 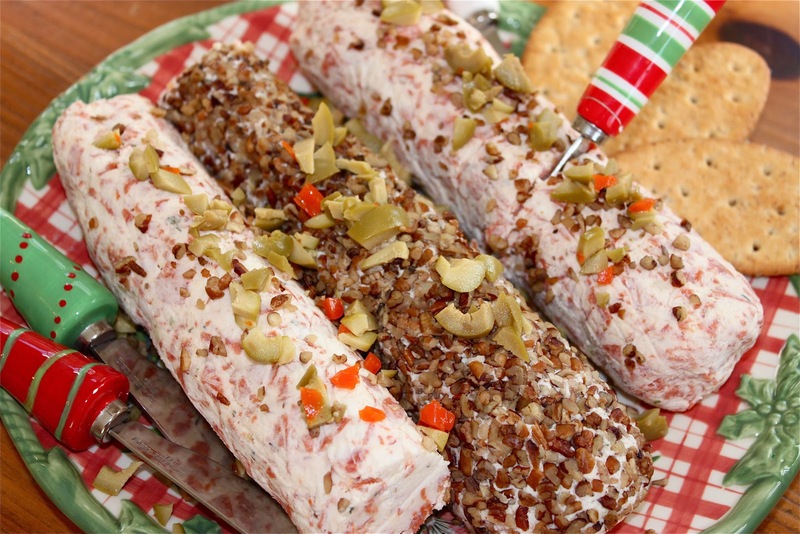 I love cheese logs but somehow I didn’t have time to make any this year. They are so simple and great to have on hand during the holidays. I’m sure you’ve enjoyed having your parents visit and I hope your Dad’s doing well after his surgery. Ciao! This recipe looks really good, I have never tried something like this before. I always love to try new things. Hope your father is better now! Oh Roz I love that kitchen photo. Always great to see the family ladies spreading the Christmas love!! Hope all is well with your dad Roz. Thanks for sharing the great cheese log recipes. They are just perfect for New Years Eve. 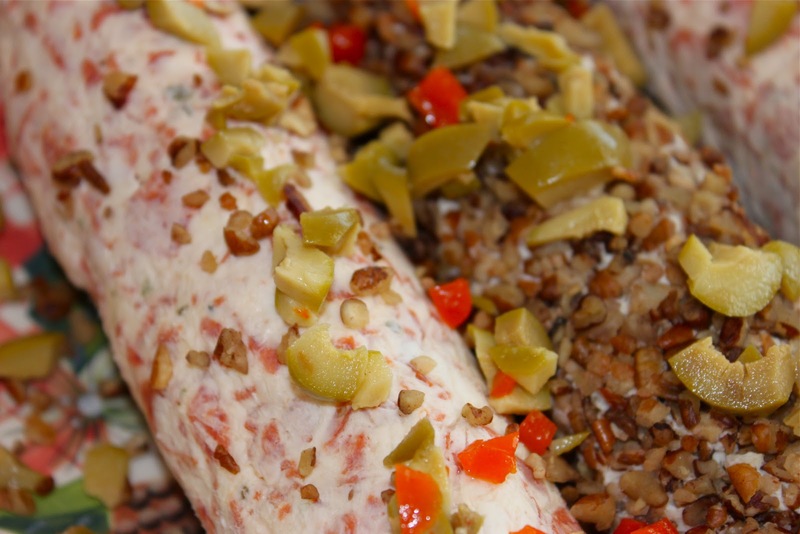 The chicken log may just make the party! What yummy treats! Happy Holidays to you and your family, Roz!